The Annual Presentation Night will be held at the club on Sunday December 2 commencing at 5 pm. Tickets are available from the club office for $25 a head. This includes the main meal, desert and all refreshments including wine, beer and soft drinks. The annual chipping contest will also be held at the start of the function so bring your favourite chipper to avoid getting that rusty old one! At the Presentation all of our Champions, Gold Medalists and special award winners will be presented with their trophies or medals and it would be great to see as many members present as possible to help celebrate this important occasion. Next Saturday November 10, sees the men playoff for the 2018 Gold Medals. This event is held in conjunction with the first of the new season monthly medals. If you won a monthly medal from November 2017 to October 2018 then you are in with a shot. A Medal is awarded for all grades. You playoff in the grade you won your monthly medal but off your current handicap. The Ladies Gold Medal day will be held on Tuesday November 13. A full list of Entrants can be found by clicking here. Last Wednesday it has been reported that Tim Condon tried to walk on water on the lake in front of the 16th green. Tim, ever the good Samaritan, was attempting to retrieve his playing partners ball when he mistook the weed growing on the surface as grass. It is quite deep and Tim went in up to his neck. His partners eventually saved Tim by helping him out. After they had finished laughing of course! For those interested members who wish to represent their club it is time to nominate for the Mens Pennant teams. We have entered 4 teams in 2019, the B Pennant (for those with handicaps greater than 5.5), C Pennant (for those with handicaps greater than 12.5) and two in the White Horse Cup (handicap matchplay -handicaps 24 or less). The form is available in the golf shop along with the draws and dates of matches. Please fill in the details and get involved with your club. Friday saw the playing of the 2019 final of the Club Fourball Matchplay Championship. The winning team was Pat Paris and Dene Herbert with a 3/1 winning margin over Ron Hewson and Paul Rodgers. Congratulations to both pairs. The weather is great, the course is ideal, so why not get out on the course and play in some of our competitions? Many of our members are doing just that and some good performances were recorded in our competitions during the week. A fun day was had by all on Saturday where the ultimate stableford team game was played, a split six, where all three stableford team formats are used. As always with this format it comes down to the last six holes, where the multiplier is used and big scores are possible, to determine the winners. Steve Oppert and Dave Ransom ended with 69 points to beat 3 other teams who had scored 64 points. Liz Armstrong matched up with Shirley Walsh to win the Ladies with a score of 61. Much fun was had by all. Jennelle Anderson scored a good 38 points to take out the Lady Veterans stableford on Thursday with Shirley Walsh second on 36 points. Dave Ransom got lucky on Wednesday to win Division 1 with plus 2 in the Mens Par Event. The real good scores were achieved in C Grade where Lance Fredericks, refreshed and sharp after his golfing holiday, scored +4, and 4 others had scores of +3 with Terry Murphy grabbing second on a countback. 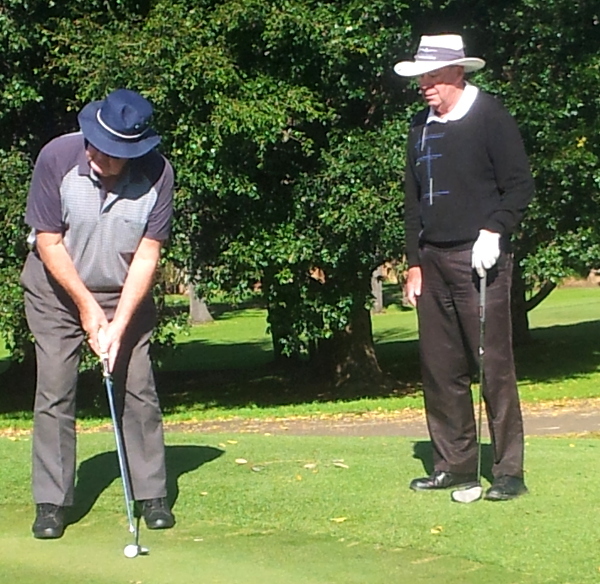 Ian Foy won D Grade on a countback with an all Square round from Keith Hales and Mick Farmilo. Gail Rutledge, Shirley Dixon and Kay Brennan scored an excellent 79 points in the Ladies ‘Pink ball’ stableford on Tueday winning by a healthy 7 points. Don’t forget to play in the Gold Medal Round. See you on the course!